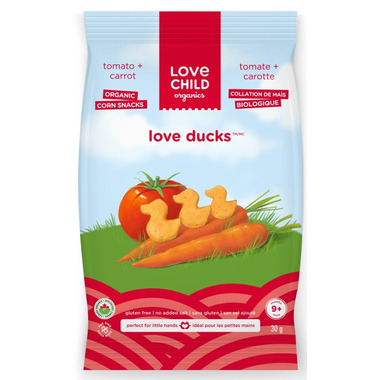 These cute-as-a-duckling organic puff snacks are made from non-GMO corn flour, rice flour, sunflower oil, and dehydrated fruits and vegetables- and nothing else! They're so yummy and fun to eat, your kids won't miss the sugar or salt. An ideal snack for babies or older kids. Quack, quack, quack. Ingredients: Organic corn grits, organic rice flour, organic sunflower oil, organic dehydrated tomato, organic dehydrated carrot. When feeding a child please ensure that they are sitting upright and supervised by an adult to reduce the risk of choking. Baby loves it, simple ingredients, easy and fast to serve, he gets distracted while I prepare his meal. Apart from being messier than other snacks with the powder all around it, this is a tasty snack for my 1 year old. These are still one of my toddlers favourites. I love the ingredients and the no salt. Easy snack to throw in the bag. My son loves these. I think the texture feels good on his teething mouth. My 9 months old baby loves it! She used to have one of those organic rice puffs but after trying this one she would only reach out for these! defintely would wait until 8-9months to let the child tastes it! Fun, easy and convenient snack. Great for babies who are learning to be independent eaters. Snacks are big enough to be grabbed by little hands and easy to chew, they just kind of melt in their mouth. Flavours are great combinations and are subtle. I have and will continue to recommend these! These are a MUST in our house. Excellent price point and my daughter adores these snacks! As always I love Love Child products, excellent quality. These chew ducks are great for babies to learn how to pick up food and feed themselves. They melt in their mouths and so it's great for babies with no teeth as well. Just be prepared they can make a mess, lol. My 15m old has been loving these since we first started giving them to him. Love that they are salt and sugar free and made in Canada. Great snack when we are on the go. My 10 month old daughter absolutely loves these snacks! I tried them too and they remind me of a much healthier version of Cheesie Puffs in a tomato flavour. Great to take on-the-go as well! My little one loves these. They are an easy shape to grasp for those just trying to pick stuff up. They are bigger than I expected but melt quite easily in the mouth so that's not a concern. Perfect on the go snack! My 11 mo old loves these. They're just the right shape, size and consistency for her. And she must love how they taste because she cheers when she sees them. Great company with great products - my kids love these! These are a light and tasty snack for the kids, nothing bad but not crazy high in nutrition. I would recommend this product to others. Easy to dissolve and my 9M old loves them. Our boys love these and always ask for them at snack time. I even sneak a few into my mouth when they're not looking. Healthy, simple snacks that make me feel good about giving them to my children. My son just loves these! He even gets excited when we open a bag. I love that they are organic, made with natural ingredients and no added sugar, amazing! This product like many other Love Child products is 5 star. Baby is in mind every step of the way in production. My baby loves these... the taste, the shape, the texture, and the fact that they dissolve so easily makes momma worry free. I do break these in half for my Littles as it is a lot to put in his mouth at 11 months. Great product. My nine-month old loves this and has this as a snack. I've tasted it myself and they taste a bit like cheese puffs without the high sodium content. Excellent starter snack for babies! Not only are the delicious but they have no added sugar! Highly recommend this product. My son loves these! like cheezies for kids!